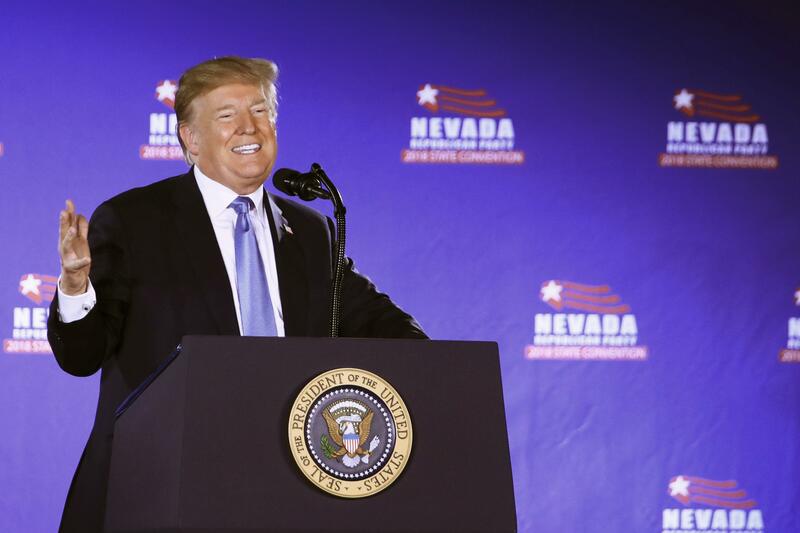 LAS VEGAS – Eager to keep the Republican Party in control of the Senate, President Donald Trump pressed his tough anti-illegal immigration stance before supporters Saturday, saying “we have to be very strong” as he sought to help boost the candidacy of a one-time critic. Trump was in Las Vegas to assist Dean Heller, the only Republican U.S. senator seeking re-election in a state that Democrat Hillary Clinton won in 2016. Trump and Heller have papered over their once prickly relationship to present a united front in their shared goal of helping Republicans maintain, if not expand, their thin 51-49 majority in the Senate in November’s congressional elections. Trump said Republicans are for “strong borders, no crime” and called it a winning issue for the party. He alleged that Democrats are for “open borders and MS-13 all over our country,” referring to the violent street gang, adding that stance is a losing issue for the opposition. The president noted that Rosen was in Reno with Democratic U.S. Sen. Elizabeth Warren for the state Democratic Party convention. He again referred to Warren as “Pocahontas” to ridicule her claims of Native American ancestry. Rosen responded quickly, first on Twitter, then saying in a statement that Trump’s visit was Heller’s “reward” for his loyalty to Trump. Heller had renounced Trump during the campaign as someone who “denigrates human beings” and suggested he wouldn’t vote for Trump, but later said he did. Heller also donated to charity a $2,000 donation he received from Trump in 2015. Last year, Trump publicly scolded Heller for holding up the GOP’s long-promised effort to repeal President Barack Obama’s health care law. He later repaired his relationship with Trump and helped deliver the rewrite of U.S. tax laws to Trump’s desk. The president also intervened in Nevada’s Senate race in March and persuaded Heller’s main challenger, Republican Danny Tarkanian, to step aside and run for a U.S. House seat instead. Heller has said he didn’t ask for the favor. “I don’t think you want that,” he said. Trump was accompanied by former top campaign aides Corey Lewandowski and David Bossie, now acting as outside advisers to the president. Days earlier, Lewandowski responded with “Wah-wah” during a Fox News Channel appearance after another panelist raised the case of a 10-year-old disabled girl who had been separated from her parents under Trump’s immigration policy. The event marked Trump’s second campaign appearance this week. He was in Minnesota on Wednesday for Pete Stauber, a Republican congressional candidate running in a traditionally Democratic district. Trump is scheduled to stop in South Carolina on Monday to help boost Gov. Henry McMaster’s fortunes on the eve of a Republican gubernatorial runoff. He is also scheduled to travel to North Dakota to campaign for Republican Kevin Cramer, who is challenging U.S. Sen. Heidi Heitkamp, a Democrat seeking another six-year term in a state Trump won by 36 percentage points in 2016. Published: June 23, 2018, 1:58 p.m. Updated: June 23, 2018, 8:18 p.m.